Michelle Obama has once called George Bush her “partner in crime” at every major event where all former resident of the White House gather to highlight the importance of their friendship for her. 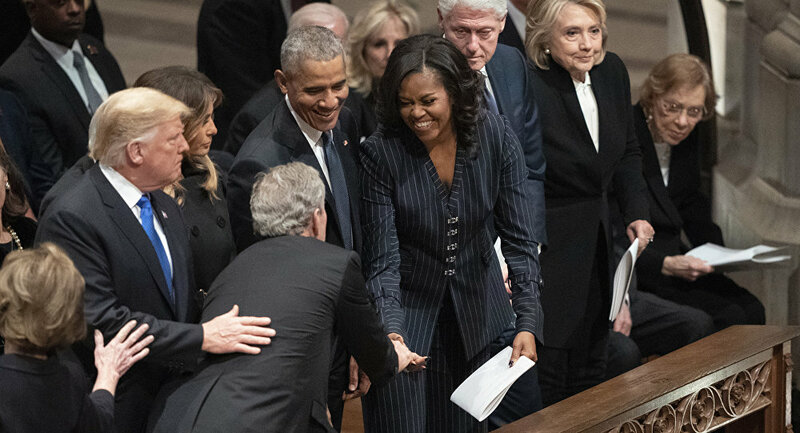 Former US President George W. Bush took a moment to slip another candy to ex-FLOTUS Michelle Obama during the funeral of his father and 41st POTUS George H.W. Bush. — Complex (@Complex) 6 декабря 2018 г.
Bush greeted former and current presidents and their wives on the bench with handshakes before having this heartwarming exchange with Michelle, who couldn't help but chuckle as she was handed the mint. — 🇮🇶🇪🇬 (@RIPKhaldani) 5 декабря 2018 г. — DJ Quota (@Quota419) 6 декабря 2018 г. — Bransol (@Troubleman_68) 5 декабря 2018 г. Sweet gesture by the former President to the former First Lady by remembering she appreciated the gesture of a candy before. That is class, which his father also had, just as the Obamas have too. — Mike (@MikeH_MapleGrov) 6 декабря 2018 г. The idea that he took the time to prepare to do this says everything about his character. — JabezIV (@jabeziv) 5 декабря 2018 г. Humor is the answer on a day like today. And I think his father would have loved this! — Eric Butler (@EricButler85233) 5 декабря 2018 г.
I adore their friendship so much. It's nice to see genuine moments, especially in these times. — Reddbabi (@Reddbabi75) 5 декабря 2018 г. — Judi Sunshine:) (@JudiSunshine) 5 декабря 2018 г. — UnstableShitholePOTUS (@sharcat12) 5 декабря 2018 г. — Shad (@MrShadM) 6 декабря 2018 г. — Leanne Aguilera (@leanneaguilera) 5 декабря 2018 г. — Robert Maguire (@RobertMaguire_) 2 сентября 2018 г.